Clonogenic assays of TNBC cell lines grown continuously in increasing concentrations of palbociclib, divided by gene expression subtypes: LAR, luminal androgen receptor; MSL, mesenchymal stem-like; MES, mesenchymal and basal-like. All cell lines are RB1 wild-type except RB1 mutant BT549. Clin Cancer Res, 2017, 23(18):5561-5572. Pictilisib (GDC-0941) purchased from Selleck. Dual PI3K/BRAF inhibition upregulates BIM and enhances apoptosis in PTEN cells. A, left, Western blot of 1205Lu cells treated with PLX4720 (3 μmol/L, 48 hours), the PI3K inhibitor GDC-0941 (3 μmol/L, 48 hours), or both drugs in combination (PtG); right, immunofluorescence staining of BIM (green) and DAPI (blue) in PTEN cells following PLX4720 treatment (3 μmol/L, 48 hours), the PI3K inhibitor LY294002 (10 μmol/L, 48 hours), or both drugs in combination (PLXtLY). B, left, immunofluorescence staining of PTEN 1205Lu following combined inhibition (3 μmol/L PLX4720 t 10 μmol/L LY294002, 48hours) increases nuclear localization of FOXO3a (green). DAPI is shown in blue. Magnification 40. Right, combined inhibition (3 μmol/L PLX4720 t 10 μmol/L LY294002, 48 hours) increases PTEN WM793 BIM mRNA levels to those observed with single BRAF inhibition (3 μmol/L PLX4720, 48 hours) in the PTENt WM35. C, PTEN cells were treated with PLX4720 (3 μmol/L, 48 hours), GDC-0941 (3 μmol/L, 48hours), or a combination of the 2 drugs (3Pt3G) before Annexin-V staining was analyzed by flow cytometry (*, P < 0.05 between the drug combination and each inhibitor alone). D, combined BRAF/PI3K inhibitor treatment blocks the escape of 1205Lu cells (PTEN) from therapy. Spheroids of 1205Lu cells were treated with either PLX4720 alone (3 and 10 μmol/L: data shows 3 mmol/L), LY294002 (10 μmol/L) alone or a combination of the 2 drugs for 72 hours. In other studies, spheroids were treated with drugs for 72 hours and then allowed to recover for 120 hours. Micrograph shows viability staining (green= live cells, red= dead cells). Magnification 10×. Cancer Res 2011 71, 2750-2760. Pictilisib (GDC-0941) purchased from Selleck. Combination of rapamycin and PI-103 leads to the suppression of AKT phosphorylation (phospho-specific western blot). Mel-Juso and 518A2 cells were treated with GDC-0941 from 0.05–1 μmol/L alone and in combination with rapamycin (50 nmol/L) for 24 hours. Control treatment was with DMSO. J Inves Der 2010 131, 495-503. Pictilisib (GDC-0941) purchased from Selleck. 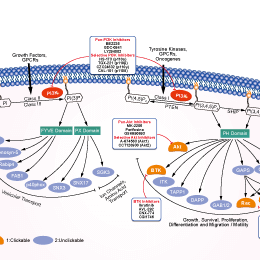 Growth inhibition induced by the FGFR inhibitor BGJ398 and the PI3K inhibitors alone or in combination. AN3CA (A-C), JHUEM2 (D-F) and MFE296 (G-I) cells were treated with the indicated doses of BGJ398, GDC-0941 a n d BYL719 alone or in combination for 96 hours and an Sulforhodamine B (SRB) assay was subsequently performed. Data are presented as a percentage of the control, in which cells were treated with 0.1% (v/v) DMSO. Points represent the mean of three independent experiments (each performed in triplicate). Error bars represent the standard error of the mean (SEM) and lines were fitted using non-linear regression analysis. Interaction of BGJ398 and GDC-0941(redcircles) or BYL719(blacksquares) in AN3CA(C), JHUEM2(F) and MFE296(I). 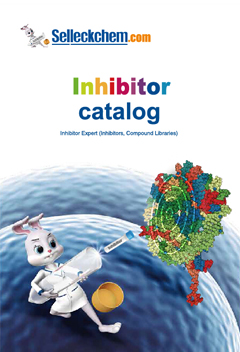 Median effect analysis was used to evaluate the interaction between the inhibitor combinations. Horizontal dotted lines indicate the boundaries for each interaction classification. Mol Cancer Ther, 2017, 16(4):637-648. Pictilisib (GDC-0941) purchased from Selleck. TGF-β induces mTORC2 activation. ( A ) NMuMG cells were treated with TGF-β for the indicated times before lysis and immunoblotting. (B ) NMuMG cells were treated or not with TGF-β for the indicated times, in the presence or absence of SB431542 or LY294002. Cell lysates were subjected to anti-Rictor immunoprecipitation, and the immunoprecipitates were subjected to in vitro kinase assays using kinase-inactive Akt1 as a substrate, before immunoblotting of the kinase reactions, immunoprecipitates and cell lysates. The left panels are from the same gel, without differential exposure. ( C ) NMuMG cells were treated or not with TGF-β or insulin for the indicated times, in the presence or absence of SB431542 or GDC-0941. The kinase activity of mTORC2 was then assessed as in B. The top panels are from the same gel, without differential exposure. (D) NMuMG cells were treated or not with TGF-β for the indicated times, in the presence or absence of SB431542 or LY294002. Cell lysates were subjected to immunoprecipitation using Rictor antibody, and/or immunoblotted. J Cell Sci 2012 125(Pt 5), 1259-73. Pictilisib (GDC-0941) purchased from Selleck. Biochim Biophys Acta 2012 1823, 2210-6. Pictilisib (GDC-0941) purchased from Selleck. After starved in serum-free medium for 24h, Breast cancer cells incubated with the indicated concentrations of GDC-0941 for 3h,followed by 15-minute stimulation of 100ng/ml EGF. Dr. Zhang of Tianjin Medical University. Pictilisib (GDC-0941) purchased from Selleck. We treated all of drugs in T47D which has a PI3KCA H1044R mutation with the concentration shown below for 1 hour and performed western blot analysis using antibodies to phospho-AKT(SERINE 472), and total AKT. Saraswati Sukumar of Johns Hopkins University School of Medicine. Pictilisib (GDC-0941) purchased from Selleck. PI3K pathway signaling in GDC-0941 and MK-2206 treated MCF-7 derivatives with PIK3CA or AKT1 mutations. Cells were grown in medium containing 5% FBS and treated with vehicle or increasing concentrations of GDC-0941 (0 nM, 50 nM, 100 nM, and 400 nM) or MK-2206 (0 nM, 100 nM, 250 nM, 1000 nM). After 24 hours of drug treatment, lysates were prepared and equal amounts of protein were load ed onto SDS-PAGE gels and blotted with the indicated antibodies. Pictilisib (GDC-0941) purchased from Selleck. Recombinant human PI3Kα, PI3Kβ, and PI3Kδ are coexpressed in a Sf9 baculovirus system with the p85α regulatory subunit and purified as GST-fusion proteins using affinity chromatography on glutathione-sepharose. Recombinant human PI3Kγ is expressed as monomeric GST-fusions and purified similarly. GDC-0941 is dissolved in DMSO and added to 20 mM Tris-HCl (pH 7.5) containing 200 μg yttrium silicate (Ysi) polylysine SPA beads, 4 mM MgCl2, 1 mM dithiothreitol (DTT), 1 μM ATP, 0.125 μCi [γ-33P]-ATP, and 4% (v/v) DMSO in a total volume of 50 μL. The recombinant GST-fusion of PI3Kα (5 ng), PI3Kβ (5 ng), PI3Kδ (5 ng), or PI3Kγ (5 ng) is added to the assay mixture to initiate the kinase reaction. After incubation for 1 hour at room temperature, the kinase reaction is terminated with 150 μL PBS. The mixture is then centrifuged for 2 minutes at 2000 rpm and read using a Wallac Microbeta counter. The reported IC50 values are calculated using a sigmoidal, dose-response curve fit in MDL Assay Explorer. Cells are exposed to various concentrations of GDC-0941 for 48, and 72 hours. Proliferation/viability of cells is detected by using the CellTiter-Glo Luminescent Cell Viability Assay. The pAkt (Ser473), cleaved caspase-3, and cleaved PARP are analyzed by western blot. The Caspase-Glo 3/7 assay and the Cell Death Detection ELISAplus assay are used to detect caspase 3/7 activity, and apoptosis, respectively. Folkes AJ, et al. J Med Chem, 2008, 51(18), 5522-5532. Junttila TT, et al. Cancer Cell, 2009, 15(5), 429-440. Haagensen EJ, et al. Br J Cancer, 2012, 106(8), 1386-1394. Raynaud FI, et al. Mol Cancer Ther. 2009, 8(7):1725-38.